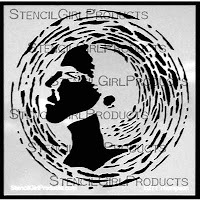 StencilGirl Talk: Love & Friendship: Placate friends with a platter of plentifully stenciled pomegranates! 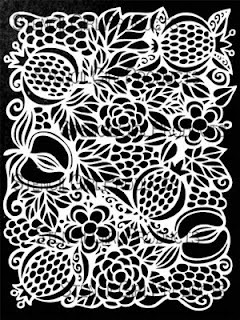 Love & Friendship: Placate friends with a platter of plentifully stenciled pomegranates! 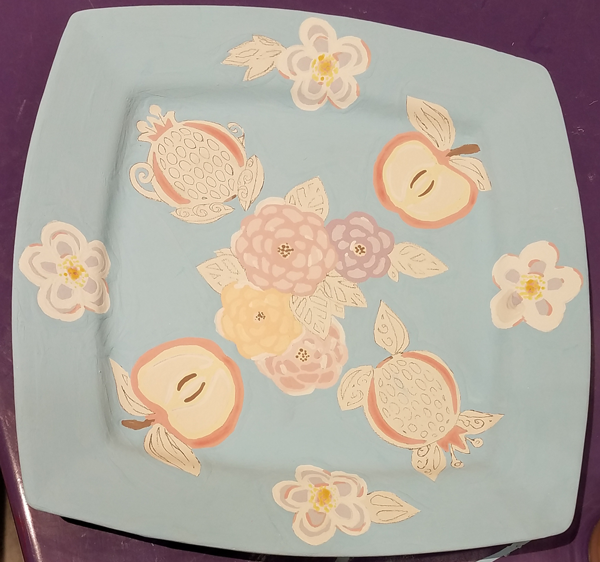 Painting plates and eating pomegranates require patience. Plucking the ruby red jewels from a pomegranate is faster than painting ruby red jewels on a pomegranate plate. The first takes about 20 minutes. The latter took me 8+ rather zen-like hours. 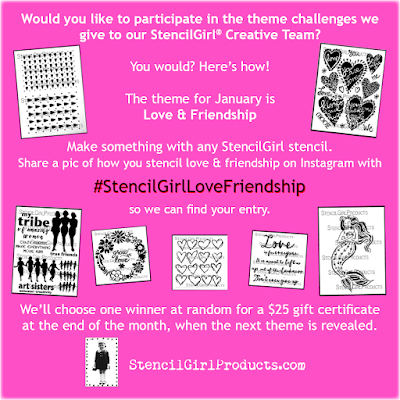 Love and Friendship is our Creative Team theme for January. I am kicking the theme off with a platter of pomegranates on which to place plentifully perfect treats to placate playful friends. #2 If you choose to paint an intense pattern, remember to paint a sheer white coat (As You Wish calls it Polar Bear White) over the design so you don't need to go back and worry about any slim unpainted lines. I forgot this step. Then it was just a matter of getting in the zone and painting. The difficult thing for me is that even though there are examples of fired colors, the paint looks nothing like that when you are applying it. #3 Three layers of blue for the background should give me almost no brush strokes when the platter is fired. Tip: When you are tired. Stop. Stand up. Move around. Shake your hands and arms out. #4 Paint your elements in an order that makes sense to you. 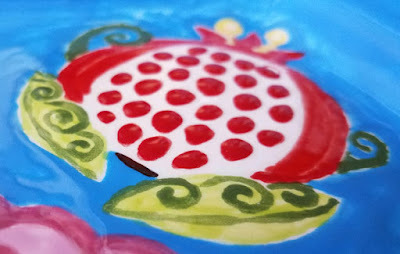 Give some thought to how you are going to rest your hand on the plate vs. paint dry time. 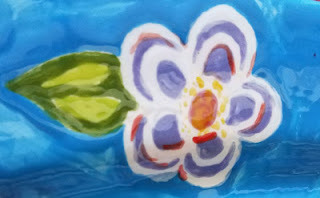 I started with the most neutral colors in the apples and then went to the flowers in the middle, starting with the petals. I don't know why they would not let me stay just 2 more hours to finish the leaves and individual pomegranate seeds. I mean if I could stand the same round of Christmas songs one more time, surely they could have played along! Ha! That earlier tip about being tired. Yeah. It was past time for me to stop! I took pics of the paints I planned to use for the berries so I would not forget. I used a slightly lighter red for the apples. 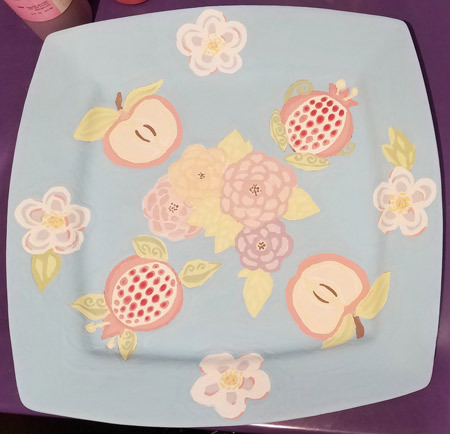 One of the store helpers suggested that brush strokes were not the worst thing and she felt they could make the plate look more handmade and striking. I am hoping she is correct and that my leaves will look lovely! Here it is! 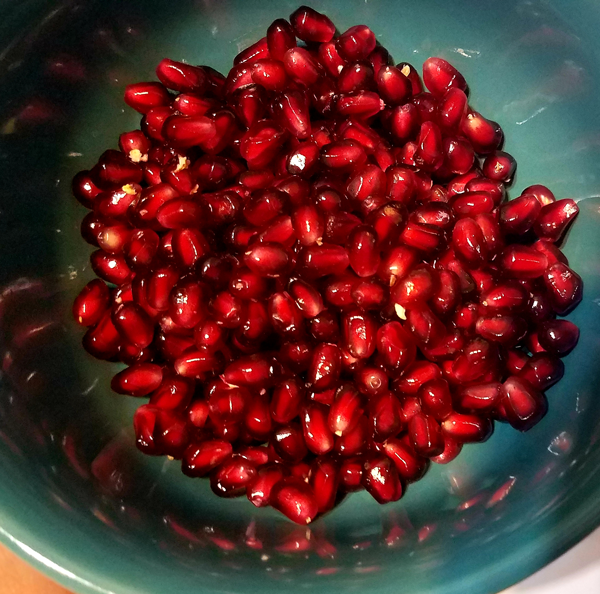 My platter of pomegranates to placate friends with plentifully perfect treats. Practice makes perfect when painting pomegranates. 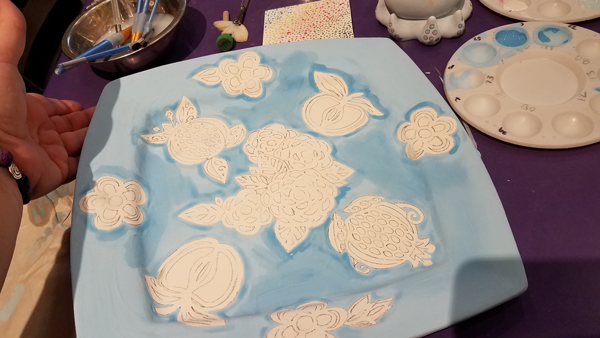 I'll be proud to use my perfectly imperfect plate and I'll be ready to paint another soon! I must have friends over to party with my plate first! 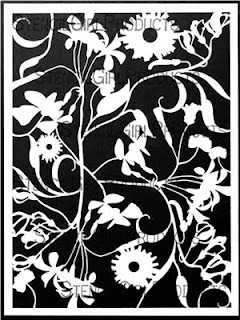 and Kate Thompson's Angel Circle S271. I hope you find as much satisfaction making and sharing your art with friends as I have with you today! 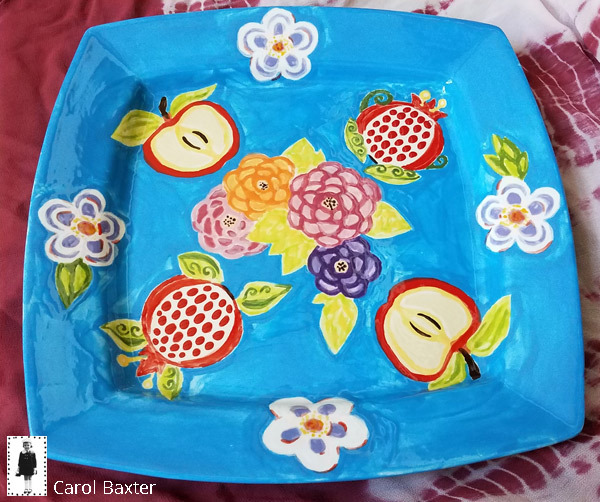 Carol, love those designs on the plate, that pretty blue background makes the fruit and flowers really pop!